Win a Crunchmaster 8-Pack Sampler! We’re thrilled to be offering a Crunchmaster 8-Pack Sampler to 10 lucky Appetite for Health winners! Enjoy them as part of a healthy lifestyle – right from the bag or box. Or, add a little imagination and pair them with your favorite dips, spreads and toppings to create a unique, tasty treat for your friends and family. 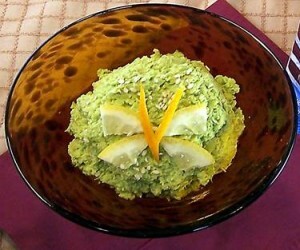 For St. Patrick’s Day, try this Edamame Dip with your favorite Crunchmaster Crackers! Like us on Facebook and like Crunchmaster too! Entries will be received until March 21, 2015 at midnight EST. Please share an article of ours via your social networks to receive extra credit. 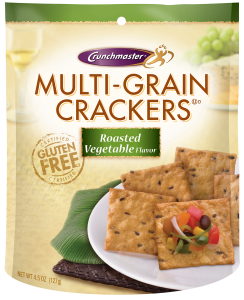 Crunchmaster is tasty, nutritious, healthy, and whole grain. I love that they are 100% whole grain. I love how light, crispy and flavorful the are. I haven’t had a chance to try this brand, but I love the fact that they are 100% whole grain. Sounds like a great snack for my family. I shared on Twitter and FB. I haven’t tried these yet, but I love crunchy snacks, and to be a healthy snack also is a plus. I have “Liked” Crunchmaster on Facebook. I have not had Crunchmaster Baked Rice Crackers yet. I think I would really like them because they are crispy and I love crispy crackers! We haven’t had these Crunchmaster’s Baked Rice Crackers before. After reading about them I think we would definitely like them and they sound like they would be great with various dips. I would love to try Crunchmaster crackers. They look so yummy!